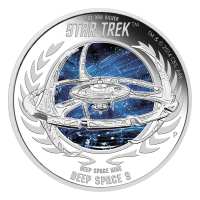 1 oz 2015 Star Trek Deep Space Nine - DS9 Silver Proof Coin | ?? 1盎司2015年星际旅行深空九号|DS9精制银币 The beautiful colourized, proof quality coin has vibrant colours, a highly polished appearance and comes with a numbered certificate of authenticity. The mintage, including the two coin sets, is limited to only 6500 coins worldwide meaning that this is sure to become a prized coin for both numismatic collectors and Star Trek fans. Star Trek Deep Space Nine ran from 1993 to 1999. The series featured different themes compared to the previous Star Trek series, with much less exploration of physical space. The obverse of the coin features the Ian Rank Broadley effigy of Queen Elizabeth II and the words "Queen Elizabeth II 1 Dollar Tuvalu 2015" and the artist's initials. The reverse of the other coin features a relief of Deep Space 9 majestically soaring over a colourized space scene. The wreath of laurel leaves surrounding the edges of the coin mimic the logo of the United Federation of Planets and were used in ancient Rome to symbolize victory. DS-9 was originally a Cardassian space station, which the Bajoran's invited the United Federation of Planets to administer control of after they gained their freedom from the Cardassians. This coin, like the original run of the series, is strictly limited, get yours today before they are all gone!